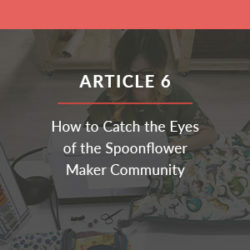 Want to make the leap into designing your own patterns, but you’re not sure where to start? Designing a repeating pattern doesn’t have to be daunting! 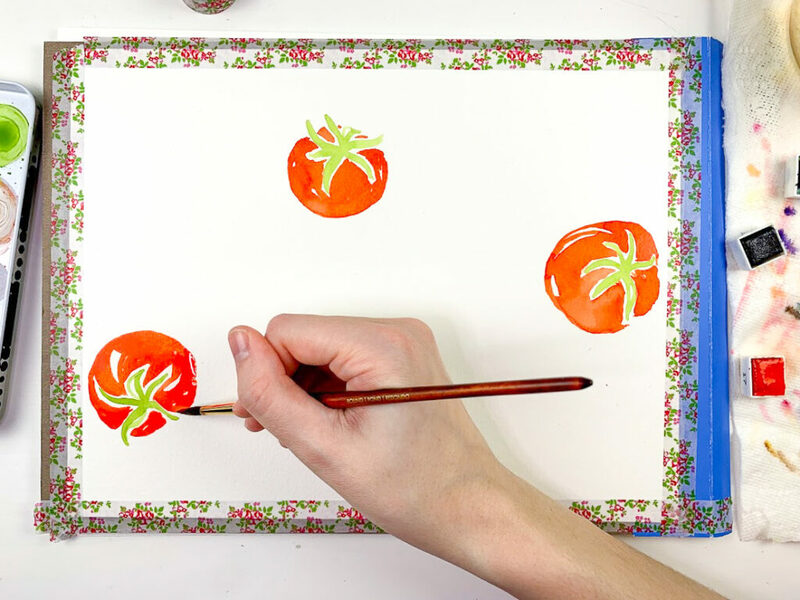 Today, Annie Parsons (anniedrawsthings in the Spoonflower Marketplace) demystifies the process for creating a piece of artwork that can easily be transformed into fabric, wallpaper or gift wrap. Ready to get started? 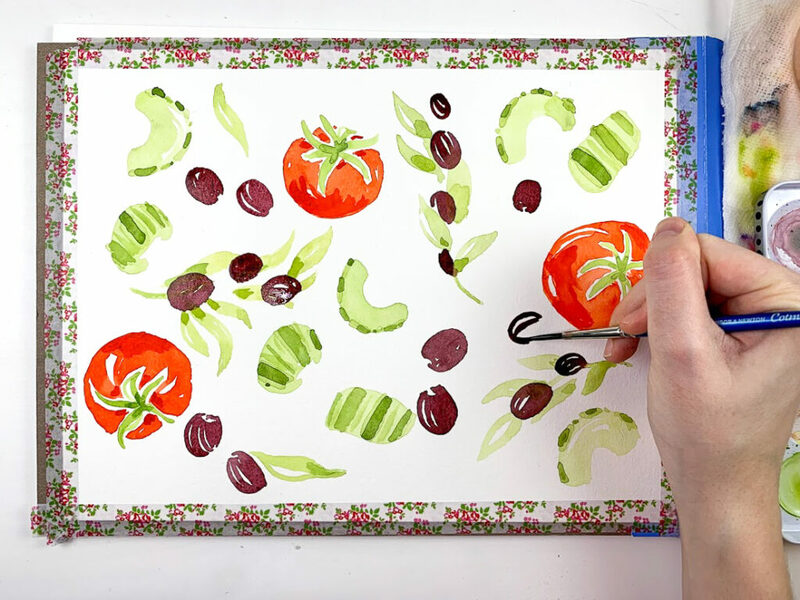 Moving from painting artwork to creating repeating patterns is easier than you might imagine, but, where to start? It all begins with the blank page and adding elements in a way that will make the digital chunk of the process a breeze. Like baking a cake, turning your artwork into a pattern is a two part process. The first key to success is selecting the right ingredients and combining them in such a way that you maximize your potential for a successful end product (YUM, cake!). Today, I’ll demonstrate how to choose those elements and combine them on that blank page to ensure your best success when you reach the digital phase of pattern making. Just like baking, your starting point in your pattern-building process is to choose the ingredients that will make up your end product. Instead of choosing flour and sugar for a cake, we’ll start by choosing design elements for our final pattern block. A design element can be any shape that you draw, whether it’s a flower, an abstract shape, or a novelty item like a bicycle. 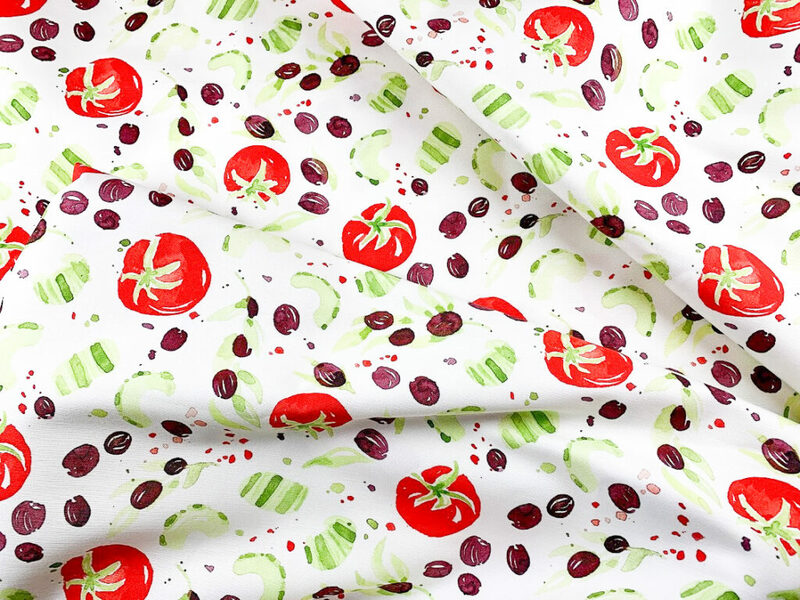 For this pattern, I’m using a delicious Greek salad that my family and I ate on vacation as inspiration, so I’ve chosen fresh vegetables to be my pattern elements. 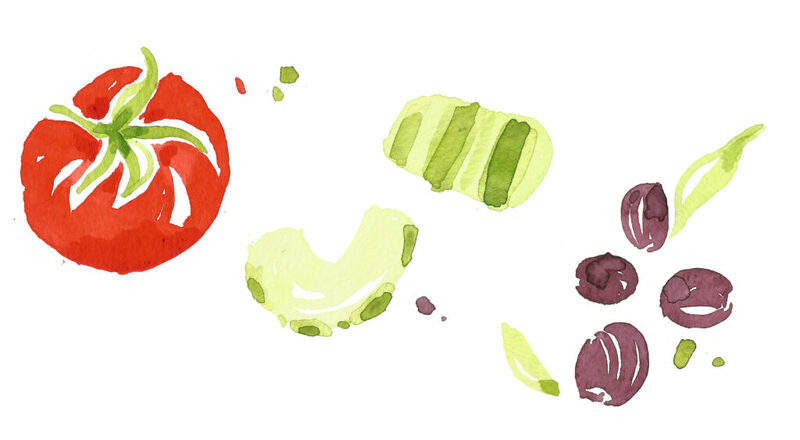 Annie’s elements include the ingredients that make up a Greek salad. For a toss pattern, it’s best to choose large, bold elements to be the focal point of your pattern, and medium and small elements to be your supporting players. I’ve chosen some perfectly ripened, plump red tomatoes for my large element, the variegated cucumber wedges as the medium element, and the deep purple Kalamata olives as the small elements. In baking, it’s important to start combining your dry ingredients first, and then add wet ingredients later. In the same way, using a specific order and method to drawing your pattern elements can help your final pattern look amazing. When you’re ready to start drawing your pattern on paper, work from your largest design elements to the smallest. That way, your biggest, most important elements have priority of placement, and you can fill in any gaps with your smallest elements. Staying away from the edges prevents incomplete elements which won’t repeat well. 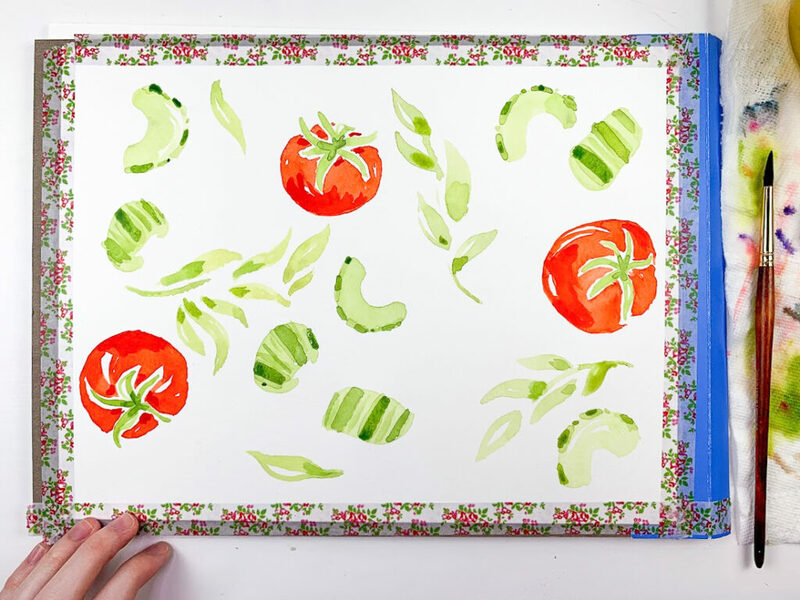 While you’re drawing or painting your pattern, imagine how you want your artwork to look on a piece of fabric or paper. How do you want a customer to view your pattern? Can you see them being drawn in by your work, noticing the beautiful details of your art? Can you picture them looking at your pattern spread across a large surface like a skirt or a tablecloth? Dynamic patterns engage customers and look beautiful on products, and the best way to keep your pattern dynamic is to avoid lineups. A lineup is when similar large elements dominate your repeat and distract your viewer from the rest of your pattern. 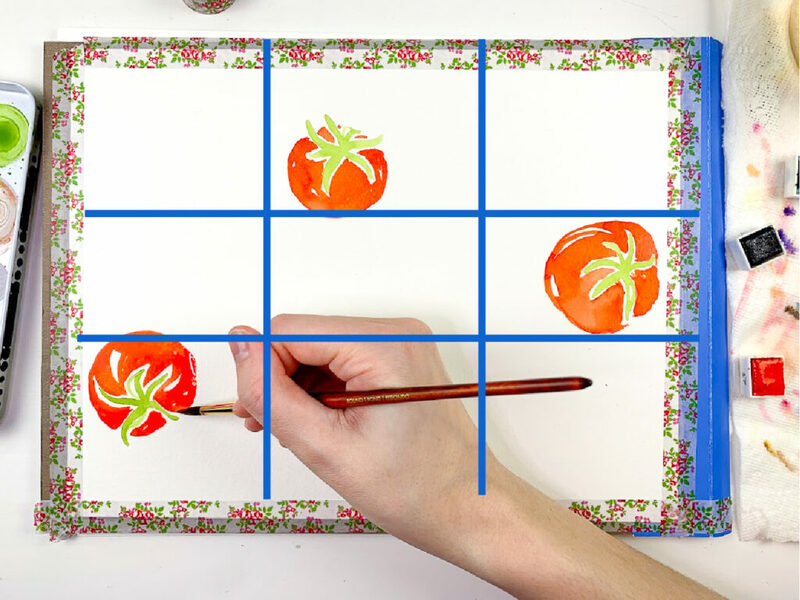 To avoid lineups of elements when repeating, use an imaginary grid to place similar shapes on different vertical and horizontal planes. Let’s look back at my tomatoes to see this principle in action. Let’s jump back to our baking metaphor for a moment: if you’re following a cake recipe, you probably have a picture of what your end result will look like. You don’t have that when you’re creating a pattern from scratch, but it always helps to imagine your finished fabric while you’re making your artwork. This helps you make choices that will save time later. For example, I knew from the beginning that I wanted this pattern to be multidirectional (elements facing every direction) rather than one directional (elements facing only one direction). 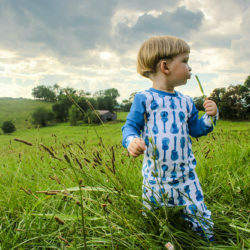 Sewists can turn multidirectional fabric any way they need to for their projects, which makes them a more versatile option in the Spoonflower Marketplace. Because of this, I saved myself some work in the digital stage by going ahead and painting elements facing upside down and sideways. Ta-da! Multidirectional artwork from the very beginning. Following these steps will help you make a piece of artwork that’s ready for scanning and digitizing! In other words, you’ll have a cake batter that’s ready to go in the oven. 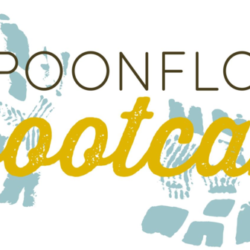 For more information on completing your pattern, you can sign up for my From Page to Pattern Skillshare class, which takes you step-by-step through the digital editing process, and you can check out all the other great design resources on Spoonflower’s blog! 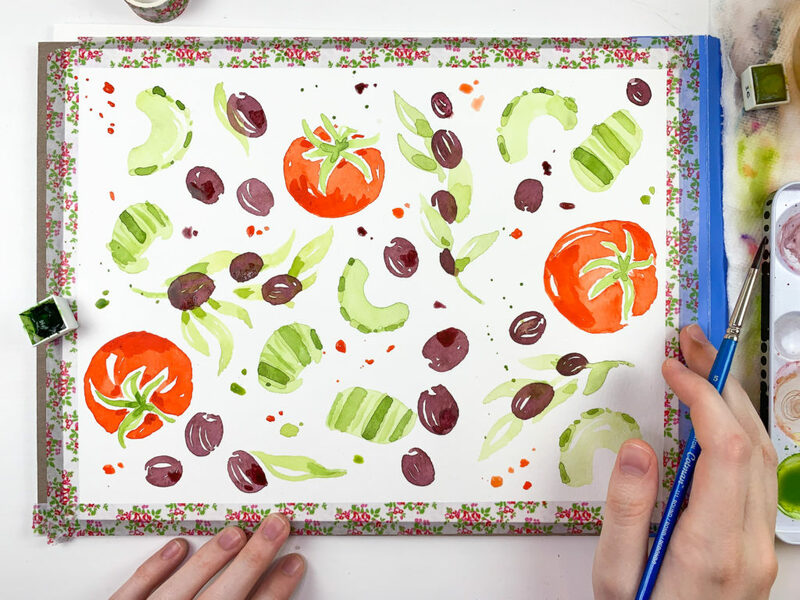 Thanks so much for joining me for painting and pattern-making today! For more tips, techniques, and behind-the-scenes looks at this pattern, check out Spoonflower’s Instagram feed. Feel free to join me on Instagram as well and send me a message if you have a question or just want to say hi! Happy making, and have an awesome day. 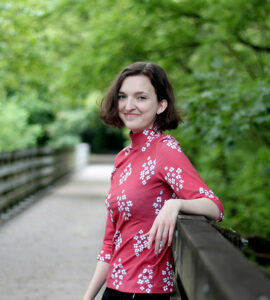 Annie Parsons is a designer and teacher on a mission to create bold, beautiful patterns for everyday use. 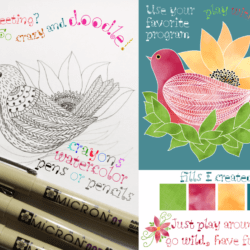 She loves creating hand-drawn designs using colorful watercolors and inks. You can follow her artistic adventures on Instagram (@anniedrawsthings), check out her Spoonflower shop here, and enroll for her new Skillshare art and design classes here!